You’ll grasp the backdrop and the idea of this game immediately. The zombie apocalypse has happened, you need to fight to save the remnants of humanity and the only way you can do that is to blow away as many of the lurching undead as you can. You have a kind of first-person view of the action – you can see your arms and gun, but you are in a fixed position (actually you are in a wheelchair). 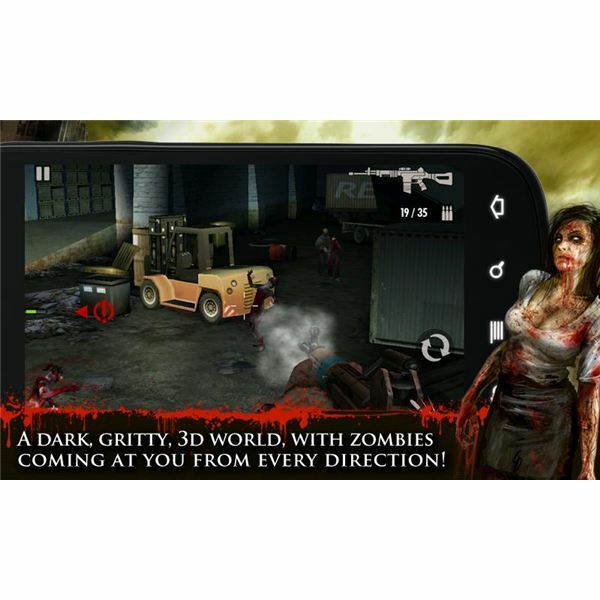 You need to infiltrate a zombie-infested city and collect supplies and rescue civilians. The game is really well-presented and you’ll see some nice zombie concept art as you load it up. Once you reach the main city map you can look around for missions or visit the store. Each mission explains the aim and the reward you’ll get in terms of cash and XP. It also recommends a weapon to use and there are several to choose from, if you can afford them, from pistols to grenade launchers. The gameplay is focused on protecting your friend Evelyn and other survivors. She rushes in and does all the dangerous stuff while you pick off zombies at a distance. You’ll need to repel a certain number without her getting mauled in order to complete the level and move on. Sometimes she’s after supplies, sometimes there are other civilians to protect and rescue. You are effectively a turret so your main strategic dilemma is when to reload, because it takes a while. The controls are simple — fire, reload, zoom and switch weapon. You pan around and aim by swiping your finger. The environments look great, you’ll find explosive barrels dotted around to help you take out zombies, and there are various types. Most of them shuffle, but in order to mix up the gameplay you’ll encounter some fast zombies too. Headshots are always the best way to take them out and you’ll be rewarded with a big blood splatter and instant takedown if your aim is true. An atmospheric soundtrack adds to the overall immersion, but the voiceover work is pretty awful. Overall this is an improved version of the original Contract Killer and it has zombies in it so you can’t go wrong….or can you? Sadly the freemium model has some major flaws. This is one of those freemium titles that has two types of in game cash – there are dollars and there is gold. You’ll accumulate dollars as you play through and they allow you to buy certain items. Some of the best weapons can only be bought with gold and you’ll need to part with real cash to acquire it through the in-game purchase option. It is pretty annoying not to be able to get your hands on certain weapons without paying out real cash, but you do get some content for free. 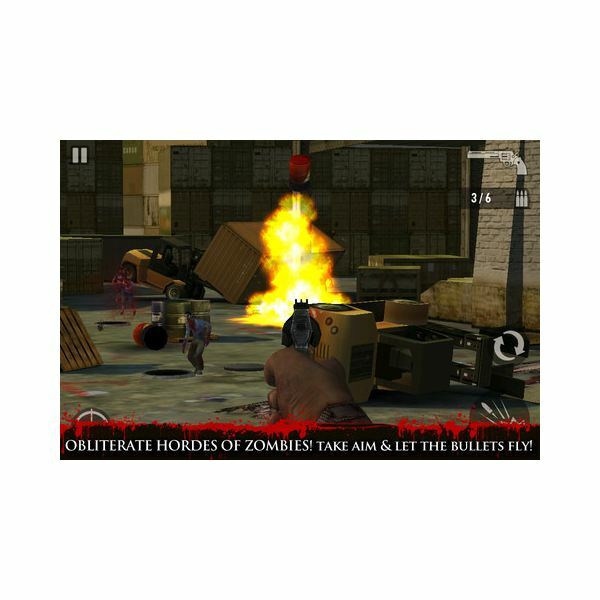 As you progress through the levels you are going to struggle to cope with the zombies if you don’t have the best weapons, so it can become quite frustrating. You will need to spend some real cash if you want to play on. It is also pretty repetitive so you may find that you get bored of the gameplay quite quickly anyway. The other downside is the aggressive advertising trying to entice you to buy gold. This seems like a pretty shoddy attempt to exploit the freemium model – in-game purchases are way too expensive and you don’t get enough content for free. It’s a pretty straightforward game really so there isn’t much room for strategy, but here are a few tips that might help you to survive. Always aim for the head — headshots are the fastest way to take a zombie down. Make sure you use the zoom button to increase your accuracy. Pay attention to the recommended weapon for each level. Even if you don’t have that specific weapon make sure you have something with a similar range. Shotguns are great close up, but useless at long range. Scan the environment for exploding barrels and try to save them for when groups of zombies are nearby. Always take out the running zombies first — they are the greatest threat. Got any tips of your own? Know a way to get further in the game without having to spend a lot of real cash? What do you think of the game and this freemium model? Please post a comment and let us know.